“This is clear proof that the global advertising claims of APP that it actively protects Sumatran tiger are untrue and highly exaggerated”, said Anwar Purwoto of WWF-Indonesia. “It s appalling that APP is pulping even the small blocks of forest it had told the world it would protect as tiger habitat”, Hariansyah Usman of WALHI Riau said. “We would like the Sinar Mas Group s buyers, investors and licensing government officials who read this report to realize how APP s media campaigns are exploiting their lack of knowledge or inexperience about Indonesia and how they mislead their customers about the brutal reality on the ground” says Hariansyah Usman. 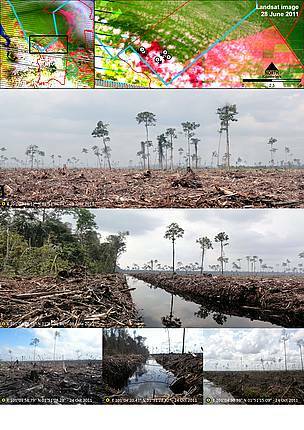 APP is interested only in feeding its giant mills with as much tropical forest wood as possible, and hoping that customers and investors will continue to believe its ridiculous conservation commitments and advertisements. APP reacted showing a map to demonstrate that its sister company and supplier PT Ruas Utama Jaya deforested areas outside the Senepis Tiger Sanctuary as defined by the government. APP then aggressively discarded the report as “poorly researched and inaccurate report which does not help anyone who really cares about preserving the natural environment and wildlife of Sumatra”. According to Eyes on the Forest’s answer however, it is clear that APP is tricking again, presenting the map of the “wrong” Tiger Sanctuary, the one proposed by the government and not to the Sacturary which actually APP committed to protect. 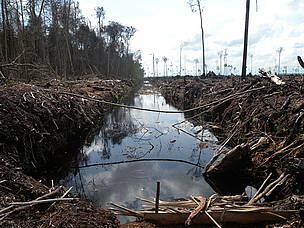 “But the ‘Proposal for Rationalization of Senepis-Buluhala Sumatra Tiger Conservation Area’ – signed off by Sinarmas Forestry (APP) and supplier executives on 22 June 2006 – confirms that the current clear felling is occurring inside the area designated and advertised by the company as the Senepis Tiger Sanctuary” they say. Eyes on the Forest’s report includes a signed map of the proposed Senepis Tiger Conservation Area boundary of 106,081 hectares, ratified in an agreement on 21 June 2006 by Sinarmas Forestry (APP) and its two suppliers, PT. Ruas Utama Jaya and PT. Suntara Gajapati (SG). And what’s about the Senepis Tiger Sanctuary as defined by the government? The Government-proposed Senepis National Park to be established for the protection of tigers and their habitat suddenly â€œdisappearedâ€ from discussion in 2006. It was replaced by APPâ€™s suggestions for a tiger sanctuary located mostly (86%) on another companyâ€™s concession not related to APP; this company was already protecting its forests through sustainable FSC-certified management. Now APP supplier (RUJ) has begun clearing even the small blocks of forest in the 14 percent of the sanctuary that the company itself had proposed for protection. Eyes on the Forest’s new report The truth behind APP s greenwash is available by Eyes on the Forest. The new report also investigates many other of APP s misleading claims and summarizes SMG/APP s profit driven, environmentally damaging actions, including destruction of unique forest types, tiger, elephant and orangutan habitat, clearance of forests inside the APP-driven UNESCO Biosphere Reserve, and illegal drainage of deep peat soils releasing millions of tons of greenhouse gases into the atmosphere, ranking APP ahead of 156 countries in greenhouse gas emissions. Companies that have cut off business ties with APP include: Office Depot, Staples, Kraft, United Stationers, Target and Mattel (USA); Idisa Papel (Spain); Metro Group, KiK and Adidas (Germany); Woolworths and Metcash (Australia); Robert Horne Group, Tesco, Sainsbury and Marks & Spencer (UK); NestlÃ¨ (Switzerland); Unilever (Netherlands); Ricoh and Fuji Xerox (Japan); Zhejiang Hotels Association (China); Gucci Group (Italy); Lego (Denmark); Leclerc (France). Many others have cancelled their contracts quietly or have committed to avoid buying from the company.